The Tampa Bay Lightning have announced the firing of head coach Guy Boucher this morning. Tampa’s assistant coaches Martin Raymond and Dan Lacroix will take over behind the bench while GM Steve Yzerman searches for a new head coach. The Lightning had a strong start to the year going 6-1 but have struggled since with a record of 7-16-1. The Lightning are currently 13-17-1 and sit 14th in the Eastern Conference with 27 points. 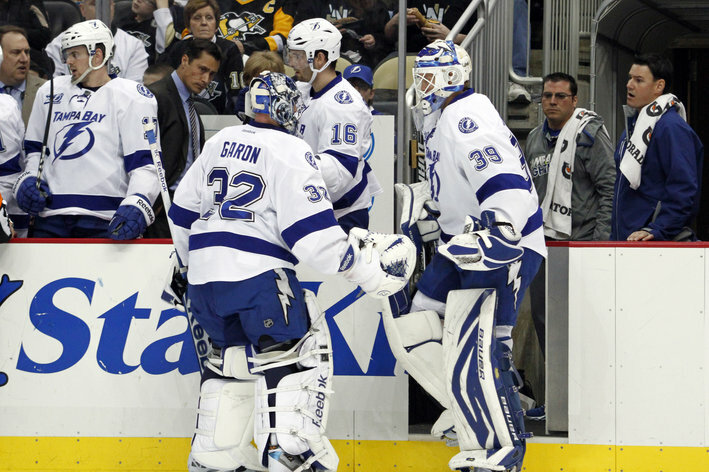 The Lightning’s struggles this season have been warranted as weak goaltending and injuries have really plagued them. The Lightning are offensive juggernauts ranking third in the league in total goals for but are 24th in the league in goals against. Starting goalie Anders Lindback hasn’t been bad in net but certainly not playing up to expectations. Backup goaltender Mathieu Garon has struggled this year. The duo isn’t what Yzerman had in mind when he acquired Lindback last summer. Injuries have really hurt the Lightning. While stars Steven Stamkos, Marty St. Louis, and Teddy Purcell have remained healthy, a revolving door of injuries have affected the Lightning. Captain Vincent Lecavalier, Ryan Malone, and Benoit Pouliot have all missed significant time with different injuries. Though Guy Boucher didn’t have control on a majority of these problems, the blame falls on the head coach as it is easier to replace one coach than the entire team. Yzerman said this decision was more based on the direction the franchise was heading rather than this season’s failures. Lindy Ruff – The Buffalo Sabres fired Ruff earlier this year. He was with Buffalo for over 15 years and has had success bringing them to a Stanley Cup Final. Being well known around the league, Ruff will have no problem finding another coaching job in the league and if interested, will be offered the job to the Lightning. Ruff has a strong relationship with Yzerman as they worked on the 2010 Canadian Olympic team together. Ruff would be a strong voice that could guide the Lightning in a positive direction. Jon Cooper – Cooper is the head coach of the Lightning’s AHL affiliate Syracuse Crunch. He has worked with and grown the players there tremendously to the point where many of them including Cory Conacher and Alex Killorn are having success with the big league team this season. The only question mark with Cooper is whether or not Yzerman wants to go with another young coach that has excelled in the minor leagues, but is unproven in the NHL, like Boucher was. Only time will tell where Boucher will end up next and who the Lightning decide to hire as their new head coach.. This entry was posted in News, Trades, & Signings and tagged Alex Killorn, Anders Lindback, Benoit Pouliot, Buffalo Sabres, Cory Conacher, Dan Lacroix, Guy Boucher, Jon Cooper, Lindy Ruff, Martin Raymond, Martin St. Louis, Mathieu Garon, NHL, Ryan Malone, Steve Yzerman, Steven Stamkos, Tampa Bay Lightning, Teddy Purcell, Vincent Lecavalier. Bookmark the permalink.